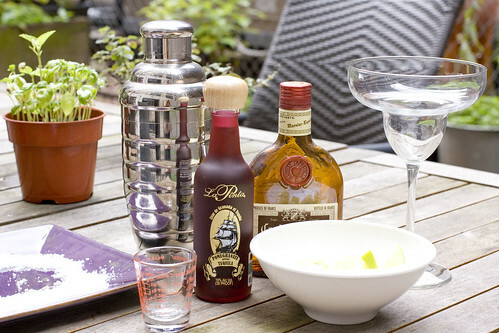 It’s easier to make drinks at home than you think and a few helpful tools can make it even easier. First, a cocktail shaker. It’s basically a cup with a two part lid. You shake and then remove just the top cap and the other part of the lid acts as a strainer. If you don’t have one, don’t worry. Use a large cup, stir where I say shake, and use any strainer you have. 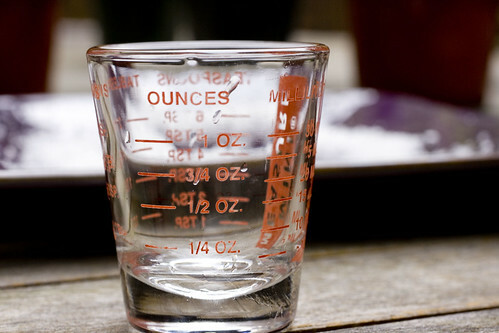 Next, I use this little measuring shot glass pretty often, not just for drinks. It’s just like a measuring cup, but for smaller quantities. If you don’t have one, 1 oz is equal to 2 tablespoons. 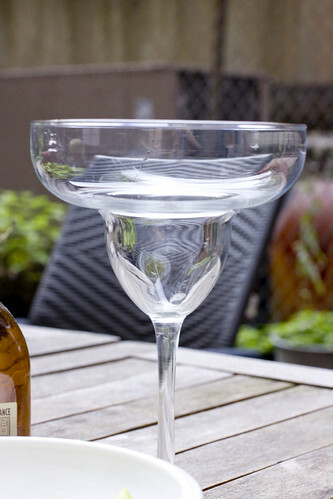 Lastly, I served in a Margarita glass but that’s really not necessary, and actually my glass is rather large (more suitable for frozen margarita perhaps) so my drink is a bit short here. Just use a clear glass if possible. 1. 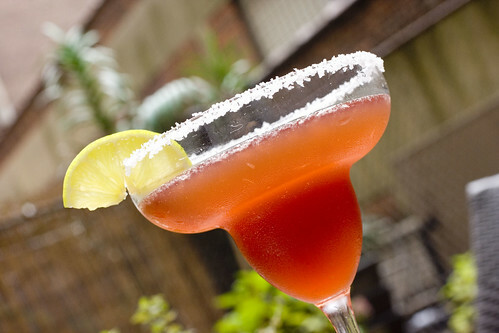 Use a wedge of lime to wet the rim of your glass. 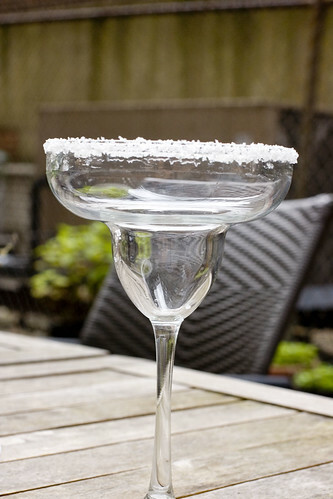 Pour some sea salt on a plate and dip the rim of the glass in the salt. 2. Fill the shaker about 2/3 up with ice (exactly how much doesn’t really matter because you are straining it). 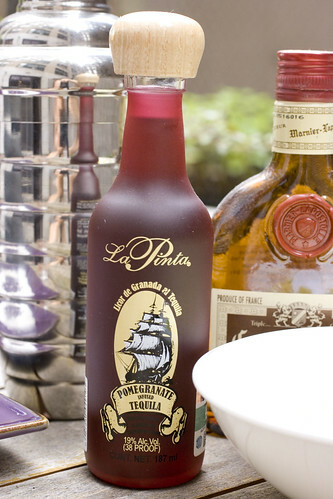 Pour in pomegranate infused tequila, Grand Marnier, and lime juice. Cover and shake vigorously. 3. Strain into glass, trying not to touch the rim. Garnish with a wedge of lime. Enjoy immediately. posted by jessica	at 02:08 PM	Filed under Cocktails and Liquor. You can follow any responses to this entry through the RSS 2.0 feed. Both comments and pings are currently closed. Gosh, just what I need right now! 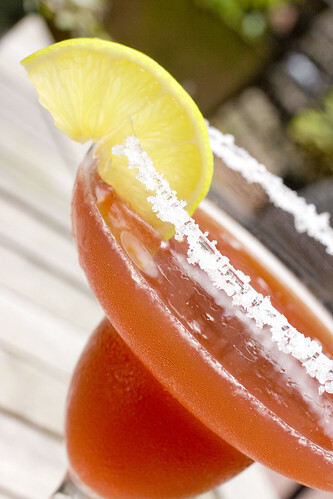 Would love to sip on that with you right now! Oh but of course. We’ll take a glass. These look delicious! Is it Friday yet? This is some gooood stuff! Strong pomegranate taste that works well neat over ice with a squeeze of lime. Had it for the first time in Cabo San Lucas but now that I am back I have found out that they have it at BevMo so there is no need to run out!